A California inmate who robbed Motel 6 in Morro Bay escaped captivity Wednesday evening and disappeared into an Illinois cornfield while being transported across the country. 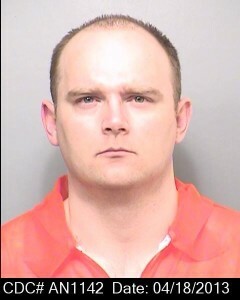 Joshua Lee Drinnon, 35, robbed a Motel 6 clerk at knife point in 2010. Drinnon was serving a 17-year prison sentence at the Richard J. Donovan Correctional Facility in San Diego. Recently, authorities transported Drinnon to Tennessee for a court appearance in which he received a six-year sentence for aggravated robbery. Drinnon escaped while on the way back from Tennessee, according to the California Department of Corrections and Rehabilitation (CDCR). Drinnon managed to get out of his restraints at a rest stop on Interstate 80 about five miles outside Princeton Illinois. He ran past the transporting officers and was was last seen scaling a fence and running into a cornfield. The Princeton County Sheriff’s Office in Illinois is now heading the search for the fugitive. The Princeton sherif’s office is working with CDCR’s Office of Correctional Safety. Approximately 100 personnel, as well as safety dogs and air support, are trying to locate Drinnon. Drinnon is 6 feet tall and 240 pounds. He has blue eyes and brown air. After he robbed the Motel 6 in 2010, police stopped Drinnon’s vehicle. He got out of the vehicle and fled on foot, initially evading capture. While police were searching for him, they described Drinnon as being 6 feet and 200 pounds. Witnesses said Drinnon appeared to be wearing a black curly wig during the robbery. In 2012, Drinnon received a 17-year sentence for robbery, which was his second strike. Hopefully he will flee to Mexico. Give them back some of their own medicine. Must be from all those beans they feed you in prison. Food in prison must be good for the loser to gain 50 pounds. If he can just make it to Chicago, maybe he can run for office and eventually get elected president. He would fit right in Chicago politics, vote early and vote often, even after your dead. Oh, great — we “privatized” the transport of prisoners instead of having “govmint” employees do it, and this is the result. Wonder if he paid off the private guards to let him get out of his “restraints.” Heck, if he was in cuffs and shackles, how could he get them off without some help? Exactly, because Everyone knows government is far worse at things than private business. Right?